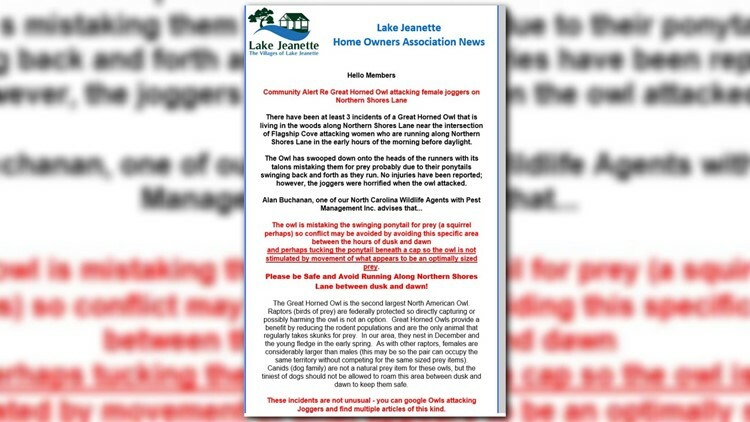 The Homeowners Association sent out this warning to residents an an owl that is attacking people. It says "at least" three people were attacked around the same intersection: between Northern Shores Lane and Flagship Cove. 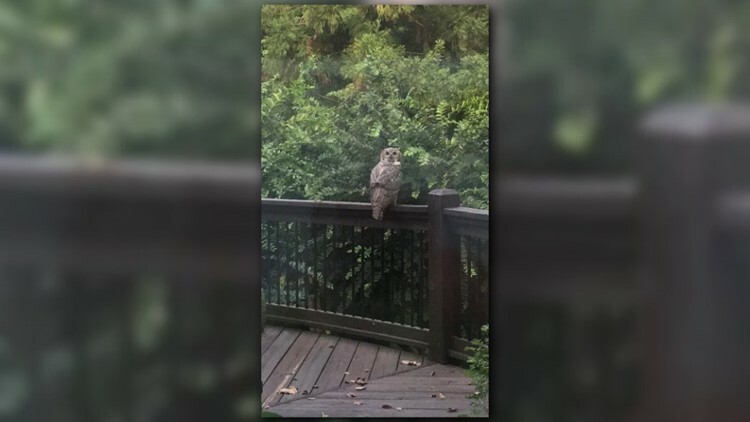 GREENSBORO, N.C. -- People who live in the Lake Jeanette area are on high alert after several runners were attacked by what the Wildlife Resources Commission identified as a Great Horned Owl. The Homeowners Association (HOA) sent out this warning to residents. It says "at least" three people were attacked around the same intersection: between Northern Shores Lane and Flagship Cove. WFMY News 2 spoke with one of the victims. Her name is Dina Marty. "I didn’t know if it was a person trying to grab me or exactly what it was, I was just stunned and then I noticed it fly off into the distance." But then it came back and targeted her a second time. "Then the second time after it tried to grab me a second time I was able to get a better view of it and I was pretty certain it was an owl." Dina said she has minor injuries from the scary experience. "I would definitely say it was painful it pulled my hair out of my ponytail I had some superficial scratches on my scalp it was definitely painful, there are red marks on my scalp." The Wildlife Resources Commission says this is probably a mix up. The Owl is mistaking runners ponytails for prey. "The wildlife commission indicated my ponytail caught the attention of the owl, mistaking it for a squirrels tail or something," Dina said. "They indicated it's actually just a juvenile so it's not very mature in its hunting instincts and so that’s why it likely it mistook my ponytail for a squirrel." The Great Horned Owl is the largest owl species in North Carolina, it's not unusual to find them in residential areas. The Wildlife Resources Commission calls this specific owl the "tiger of the air." So what can residents do to protect themselves? The Great Horned Owl is a protected species so it can't be removed from the area and it certainly cannot be harmed. The HOA and Wildlife Commission advising residents to wear hats when they run, and avoid running between dusk and dawn. This particular owl is nocturnal. "It's one of the few species that hunts skunks, so it does do some good things I suppose." Dina said.